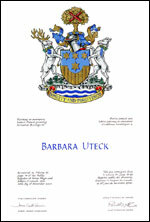 The design, featuring the colours of the Ukraine and a wheatfield, is based on the arms granted to the Wachna Family Association and thus refer to Mrs. Uteck’s maternal family. The four stars indicate that she is the fourth generation of eldest daughter of an eldest daughter. 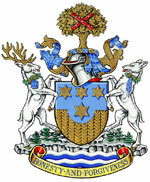 The maple tree, from the arms of office of the Herald Chancellor, and the batons of office of the Herald Chancellor mark Mrs. Uteck’s service in that role as well as her varied service to Canada. The deer were suggested by her husband, Graham Fraser, to honour his Scots roots. The collars refer to the pine forests of the Canadian shield, which are also represented by the compartment. The drum honours her son Nicholas Fraser, who is a musician, and the quill honours her son Malcolm Fraser, who is a writer. The water marks her love for the lakes and waterways of Canada. HONESTY AND FORGIVENESS are two concepts of great importance to her. 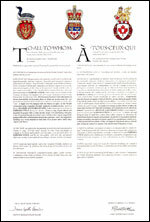 The announcement of the Letters Patent was made on March 24, 2001, in Volume 135, page 939 of the Canada Gazette.